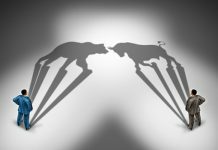 FAANG Stocks Weakness: Are The Market’s Generals Leading us to War? Market Wizards, a best-selling investment book written by Jack Schwager, is a must-read for investors looking to improve their performance. Each chapter of the book provides a biography and an interview of a highly successful trader/investor. Originally published in 1989, the book is full of valuable lessons from some of the best in the business, including Paul Tudor Jones, Jim Rogers, Marty Schwartz, and Ed Seykota. The “leading” stocks that O’Neil mentions are commonly referred to as the Market Generals. 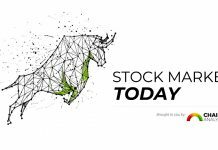 On the heels of recent weakness in some of today’s Market Generals, we examine whether these stocks are sending us a signal to seek shelter or if their lower prices are temporary and a rallyingcall for the troops. The General’s leading the market higher over the last couple of years go by the acronym of FAANG. FAANG is composed of Facebook (NASDAQ: FB), Amazon (NASDAQ: AMZN), Apple (NASDAQ: APPL), Netflix (NASDAQ: NFLX), and Google (NASDAQ: GOOGL). Per Bloomberg data, the five FAANG stocks currently account for 13.5% of the weighting of the S&P 500. The combined market cap of the FAANG’s is equal to that of the smallest 252 S&P 500 constituents. On average, each FAANG stock has over 13 times the effect on the S&P 500 index than the average stock in the index. 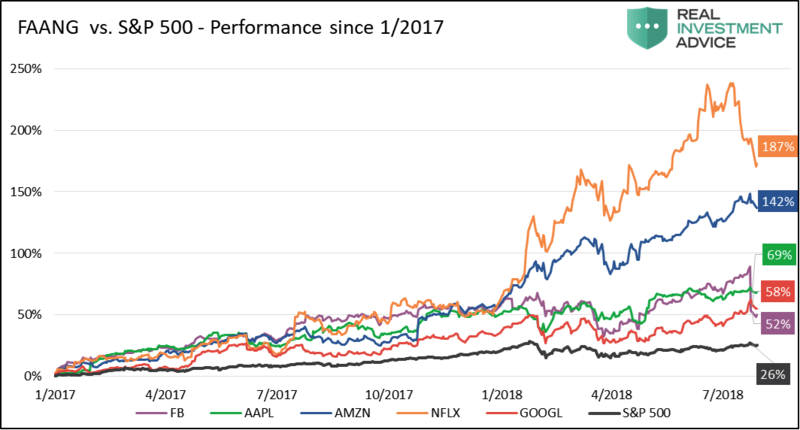 The popularity of the FAANG stocks has risen substantially over the last few years as witnessed by a futures contract and multiple ETFs that track the performance of these fivestocks’. Further, the Bank of Montreal now offers 3x leveraged ETF’s (FNGU and FNGD) that triple the performance of the five stocks. The following paragraphs provide a summaryof the most recent earnings announcements and the stock price activity for each FAANG stock. This analysis will help us appreciate what is driving these stock prices over the last two weeks and by default driving the markets. Facebook (FB) – Facebook fell over 20% on July 26,2018,erasing almost $120 billion in market capitalization. The decline was the largest one-dayloss of market value in one stock in the history of the U.S. equity markets.Interestingly, the two runners-upare Intel (NASDAQ: INTC) and Microsoft (NASDAQ: MSFT), both occurring in the year 2000. At the time, they were five-star Generals that ultimately led their troops over a cliff. Largely responsible for the drop was Facebook’s second-quarterearnings announcement which reported weaker than expected revenue and daily active users as well as corporate guidance lowering those metrics in the third and fourth quarters. The stock was also downgraded by a few Wall Street analysts. While the decline was severe, FB is still flat this year and up over 50% since January 2017. Netflix (NFLX) – Netflix has fallen 7% since a lackluster earnings report on July 23, 2018. While earnings beat estimates, they only added 670,000 U.S. subscribers in the second quarter, missing projections of 1,200,000. Thiswas the first time in five years they fell short of their user projections. Given that Netflix is trading at valuations that portend significant user growth, any signs that they are approaching product saturation should be especially concerning. Despite the loss, Netflix is still up nearly 200% since January 2017 and over 85% this year. Amazon (AMZN) – Amazon released its quarterly earnings on July 26, 2018. The stock closed the following day up about half a percent but since then has given back over 2%. 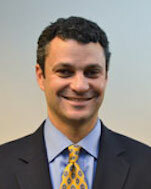 While the market initially seemed to focus on a massive beat in earnings versus projections, investors seemed to gravitate to the company’s missed revenue expectations and guidancelower for the next quarter. For the year to date,Amazon is up almost 60%, trading near its all-time high and showing few signs of weakness. Google (GOOGL) – Like Amazon, Google smashed earnings expectations, andthe stock rose nearly 5% on the day following the announcement. Unlike Amazon, their sales also beat expectations, andthey did not lower forward earnings guidance. Google is up 20% year to date and is perchednear its all-time highs. Google appears to be the strongest of the Generals. Apple (AAPL) – Apple’s second quarter earnings per share and sales surpassed Wall Street’s expectations and they raised revenue guidance for earnings for next quarter. The only wrinkle was iPhone sales, which account for more than half of their revenue, came up slightly short of expectations. As of writing this the stock is up 2.50% and within a few cents of its all-time high. 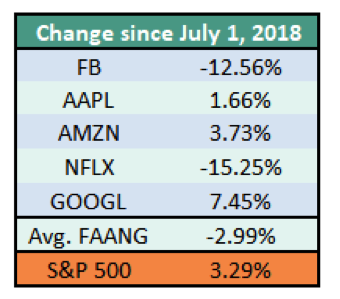 The following table summarizes the FAANG’s stock performance since July 1, 2018. Some of the Generals are flashing signs of weakness. That said, two weeks and one-quarterof earnings do not make a trend. Despite large price losses for two of the Generals, the S&P 500 took these drops and earnings announcements in stride. For the week of July 23-27, in which all but one of the FAANGs released earnings, the S&P 500 was up 0.61%. Currently,we are focused on the price action of FB and NFLX. 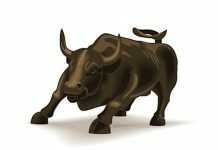 Given the “buythe dip” reflexivity that has pervaded the market and these stocks inparticular, their price action in the weeks ahead will be telling. If they remain at current levels or drift lower,we would regard this as a signal that all is not well. On the other hand, if the FAANG stocks that are struggling start to recoup losses and resume their role leading the market higher again, we will have to wait on the wisdom of William O’Neill.